The Aquatic Decomposition Score (ADS) made by van Daalen et al., was developed to approximate the Post-Mortem Submersion Interval (PMSI) in bodies recovered in salt water. Since the decomposition process in salt water differs from the process in fresh water due to salinity, the temperature, and the depth of the water, we wanted to investigate whether there is a correlation between the ADS and the PMSI and if the ADS can be used to make an estimation of the PMSI in bodies recovered from fresh water. For the latter, the PMSI was measured using Accumulated Degree Days (ADD). In our study we included seventy-six human remains found outdoors in fresh water. Their decomposition was measured using the ADS. A strong correlation was found between the ADS and the PMSI. Also, it was found that the ADS can significantly estimate the ADD. Despite the more varied circumstances under which bodies in fresh water are found when compared to those found in salt water, the ADS can be used to measure the decomposition and accurately estimate the ADD, and thus the PMSI. More research is needed to validate our method and make a prediction model with smaller confidence intervals. 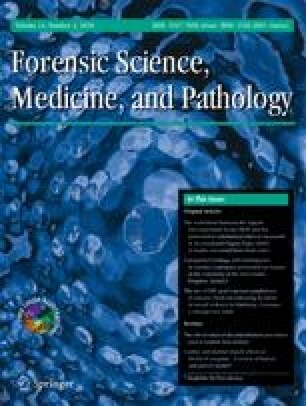 The authors would like to thank Mr. W Heutz (independent forensic physician) for scoring the 76 cases. This research did not receive any specific grant from funding agencies. World Health Organization. Violence and injury prevention and disability. 2004. http://www.who.int/mediacentre/factsheets/fs347/en/. Accessed 17 Aug 2017. Byard RW. Putrefaction - an additional complicating factor in the assessment of freshwater drownings in rivers. J Forensic Sci. 2017. https://doi.org/10.1111/1556-4029.13614. Rice PL, Orgill DP. Classification of burns. http://www.uptodate.com.proxy-ub.rug.nl/contents/classification-of-burns?source=search_result&search=rule+of+nine&selectedTitle=1~5#H16. Accessed 17 Aug 2017. Rijkswaterstaat. http://waterinfo.rws.nl/#!/nav/index/. Accessed 18 Dec 2017. Statstutor. Spearman’s correlation. https://www.statstutor.ac.uk/resources/uploaded/spearmans.pdf. Accessed 31 Dec 2017.